This post covers two Scottish National Tourist Routes around the east coast: the Fife coastal route from Kincardine to Newport and the Angus coastal route from Dundee to Stonehaven. As they’re both quite short and you can comfortably cover them in a week’s holiday, it makes sense to combine them for your driving tour. Instead of crossing the Firth of Forth on the Forth Road Bridge or the new Queensferry Crossing, the route starts further west, on the Kincardine Bridge. Built in the 1930s, it’s low above the water and not very beautiful. It used to be a swing bridge but it’s been sealed shut, since large ships no longer go this far up the Forth. In very windy weather, high-sided vehicles are re-routed across the Kincardine Bridge from the higher bridges further east, to stop them being blown over. The area north of the bridge is largely industrial and as unlovely as the bridge, but the village of Culross (pronounced coo-ross) is a hidden gem. Almost unchanged since the 17th century, much of it is now owned by the National Trust for Scotland. It is often used as a set for period films, and most recently starred in “Outlander”. There’s a ruined Abbey, the Palace (actually a merchant’s house), cobbled streets and photo opportunities round every corner. From Culross you follow the B9037 through High Valleyfield and Torryburn until you rejoin the A985 and on to Rosyth. There’s nothing much of interest along this stretch. Rosyth has a ruined church and Castle but the latter is in the dock area so it’s closed for safety reasons. You cross the M90 at Rosyth, leaving the fast-moving traffic to thunder north as you journey gently eastwards. North Queensferry is worth a visit, though the streets are quite narrow for large vehicles like motorhomes; you can use the Park and Ride facility at Halbeath and take a bus into the town. It has a small harbour between the Forth Bridge (the railway) and the Forth Road Bridge, and a passenger ferry across to South Queensferry that runs practically beneath the rail bridge. Back on the road, Silversands Bay, Burntisland and Kinghorn all have good beaches, and there are plenty of campsites along this stretch of coast. Kirkcaldy offers an excellent walk along the sea-edge and a splendidly wide esplanade. 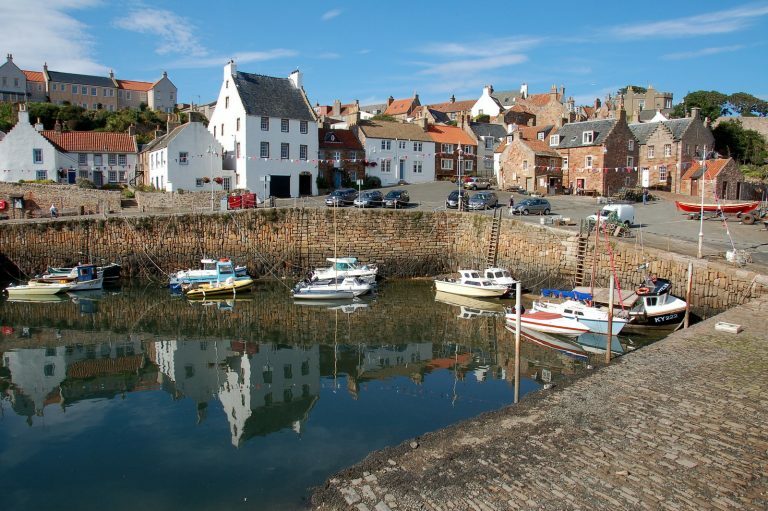 Dysart has a small but pretty harbour and Wemyss is also attractive. But most of this stretch is built up and varies from “not terribly interesting” to “ugly industrial”. The real joy of the Fife coast lies in the East Neuk. From Upper Largo, take the A917 to discover this beautiful and deservedly-famous corner of Scotland, full of ancient and picturesque fishing villages. The first one you come to is Elie, which offers both a lighthouse and the Lady’s Tower on the headland (Ness) outside the village. Earlsferry, next door to Elie but off the main road, is also worth a visit for its fine harbour. St Monans is also off the main road but it’s worth the detour, full of narrow cobbled alleys and still bustling with life. Pittenweem, Anstruther and Crail follow a similar pattern. Anstruther is the largest of this group, with two harbours; it hosts an annual art-and-craft open studios event that attracts creative types from all over Fife. There’s also an annual chamber music festival in the East Neuk, but you have to book early if you want tickets. From Crail you head on up the coast to St Andrews, Prince William’s alma mater. The University was actually founded in Edinburgh but moved to St Andrews so that the students would have less to distract them from their studies. St Andrews also boasts a ruined Cathedral and the Archbishop’s Palace, both of which are open to the public. St Andrews is, of course, famous for golf, too! And if you like shopping for bargains, the charity shops in the town are renowned for the quality of their goods. The best time to visit is May, when the University students finish for the summer and have to clear out their rooms. From St Andrews, the road takes you past Leuchars, where the church is worth a visit, and turns right along the coast at the St Michaels crossroads. This road takes you up to Tayport, where the River Tay meets the sea. Tentsmuir Forest is a lovely place to stretch your legs, with miles of marked paths and fine views across the Firth of Tay. The Fife coast route ends at Newport, where the Tay Road Bridge crosses into Dundee; this is where the Angus coast route starts. Look left as you cross the bridge, over to the Tay (rail) Bridge. The original bridge was the site of the Tay Bridge Disaster, immortalised by Scotland’s other national poet, William McGonagall, and you can still see the pillars of that first bridge sticking up out of the river. Dundee, the home of “jam, jute and journalism”, is worth a visit before you move on: it’s undergoing something of a renaissance at the moment. Its main museums, Discovery Point, Verdant Works and the MacManus Gallery, will shortly be joined by the V&A Museum of Design, in a spectacular building that looks like a ship jutting out above the river. Dundee is also the home of HMS Unicorn, one of the oldest wooden ships still floating, which is also open to the public. The official coastal route is the A92, a dual carriageway that avoids all the towns between Dundee and Arbroath. The slower but more interesting route takes you along the A930 through Broughty Ferry, where the castle looks across the Tay to Tayport along the line of the old ferry route. It’s now a museum and art gallery, and you may be lucky enough to spot a dolphin or two from the observation post. Broughty Ferry was where Dundee’s “jute barons” had their summer homes, and there are some terrific examples of grand Victorian architecture in the town. The road continues through Monifieth and Barry to Carnoustie, another home of golf. There’s a good beach for walking at East Haven before the road heads up to rejoin the dual carriageway on its way to Arbroath. 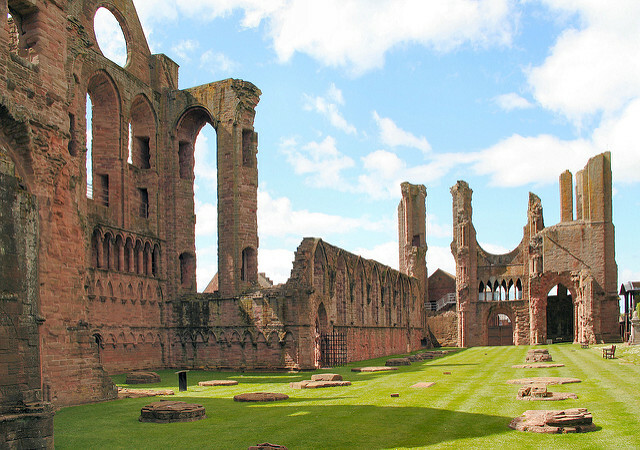 Arbroath is famous for its Abbey, site of the signing of the Declaration of Arbroath. This was a letter to the Pope from the nobles of the area, complaining about the English King: another broadside in the long battle for Scottish independence. Less well-known, but equally fascinating, is the Signal-Tower Museum, on the water-front near the harbour. It looks like a lighthouse but was actually used to signal to the keepers of the Bell Rock Lighthouse, eleven miles out to sea, and tells the story of the building of the lighthouse and of the people who worked there. Arbroath’s other claim to fame is smokies (hot-smoked haddock; not to be confused with kippers, which are smoked herrings). You can buy them at any fishmonger around the port area – just follow your nose! The old fishing harbour is now a marina full of leisure boats. Smokies didn’t originate in Arbroath: they were invented in Auchmithie, just up the road. It’s a tiny, picturesque fishing village on a dead-end road, so park outside the village and walk in if you want to visit it (you can walk all the way there along the coast from Arbroath, if you’re feeling energetic). The harbour is no longer used. 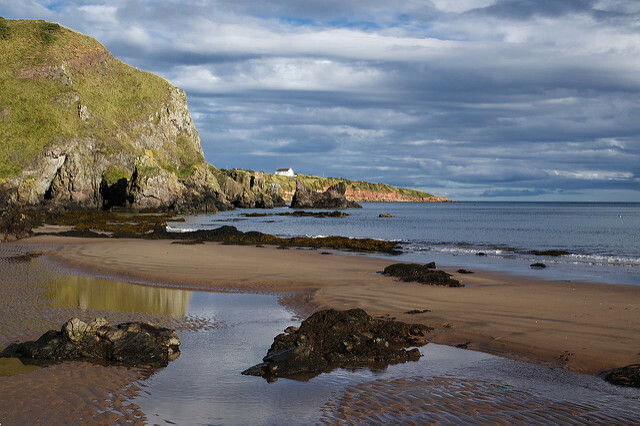 North of Arbroath is one of the best beaches in Angus: Lunan Bay. There’s a big car park and a snack shop, but it gets very busy on a sunny summer’s day. Red Castle, across the river from the main beach, is a sandstone ruin whose stone has been wonderfully carved by centuries of wind and rain. Back onto the tourist route past the tiny hamlet of Lunan, your next stop is Montrose. The church spire can be seen for miles – it’s been a landmark for sailors for centuries. In fact, it was deemed so important that the spire doesn’t belong to the church but to the town. Montrose is a handsome old town with some fine architecture, especially along the very broad High Street and its alleyways. The port is busy, having had considerable investment poured into it over the past few years. The Basin, a tidal lagoon, is an important over-wintering area for sea-birds. There’s another wildlife reserve a little further north, at St Cyrus. With waterproof footwear and at low tide, you could walk all the way here along the beach from Montrose, but most people find it easier to drive. The nature reserve covers the dunes and the grassy area behind them, so dogs can be let off the lead once you reach the beach. At the far end of the long, long sandy beach there’s a waterfall. To reach it you have to cross a moonscape of lava, full of rock-pools – it’s very easy to spend a whole day here. St Cyrus is technically in Aberdeenshire, but the sign just before the turning down to the beach tells you that it used to be in the historic county of Kincardineshire – nothing to do with the Kincardine Bridge you crossed at the beginning of this tour. It was named for Kincardine Castle, which used to be the centre of local government. Back up on top of the cliffs you drive through St Cyrus village to Inverbervie, where the designer of the tea-clipper Cutty Sark was born. There’s a monument to him just before you leave the town. The tiny village of Catterline is pretty but, like Auchmithie, the roads are a bit too narrow for a large motorhome. So your next stop is likely to be Dunottar Castle, in a spectacular position on a headland just outside Stonehaven. It’s surrounded on three sides by water and on the fourth by a steep climb down the cliff and then back up again. Many people just take photos and move on, but it is definitely worth a visit if you’re able. The “Grecian temple” on the hill nearby is a war memorial. Beyond Dunottar lies the sturdy town of Stonehaven, and the end of the route. From here you can take the Slug Road (really!) to Banchory and Royal Deeside or the A90 dual carriageway north to Aberdeen or south to Dundee, Perth and Edinburgh. Whichever way you go, there’s plenty to see and lots more adventure awaiting you.